Full-blown tone & noise generator with source code. Version 2.5 is a freeware program which does not have restrictions and it's free so it doesn't cost anything. For security reasons, you should also check out the SineGen download at LO4D.com which includes virus and malware tests. Additional screenshots of this application download may be available, too. Features download of the best hardware diagnostic software programs available for Windows. Our editors provide hardware diagnostic review along with screenshots and troubleshooting in our user forum. 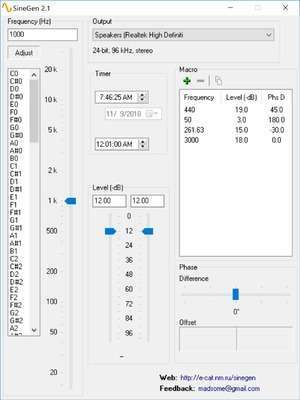 Check out some of the freeware downloads available in the benchmarker category. They contain no strings and are available at zero cost. 2.15 out of 5 based on 10 ratings. SineGen has a presence on social networks. TrustRank Based on many factors, we give this program a Trust rating of 3 / 10.